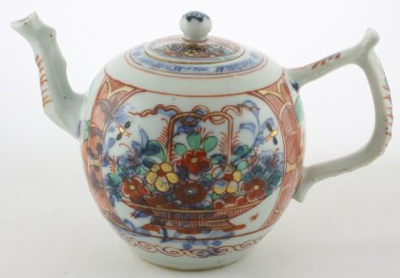 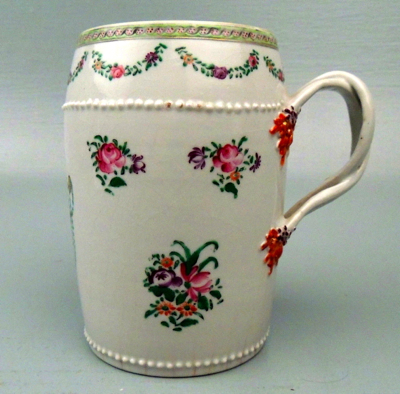 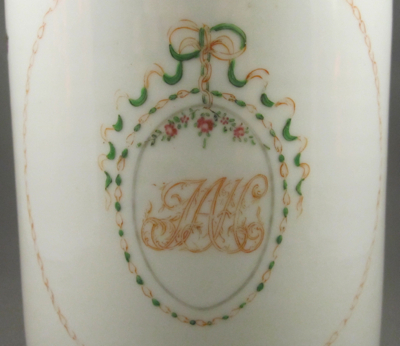 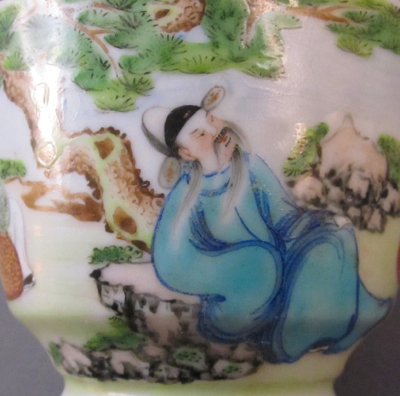 This sturdy Chinese export porcelain mug dates from the Qianlong period (1736-1795) and has floral decoration and a pseudo armorial cipher/monogram hand painted in the famille rose palette. 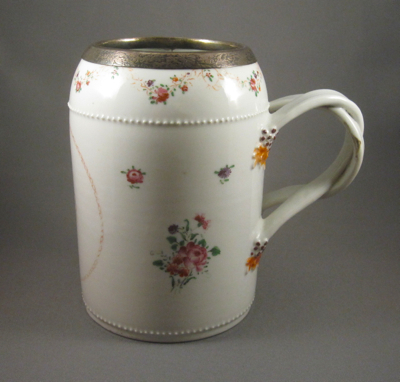 The mug stands 6-1/2″ high and holds 2 pints of liquid. 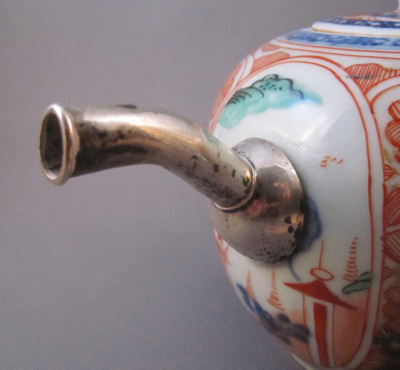 I am surprised that the entwined handle survived 230 years of use, as they are fragile and are often found broken. 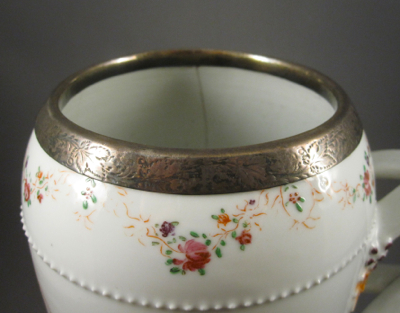 Now, you may wonder “where’s the repair?” The unsigned sterling silver mount along the top with engraved decoration serves a dual purpose. 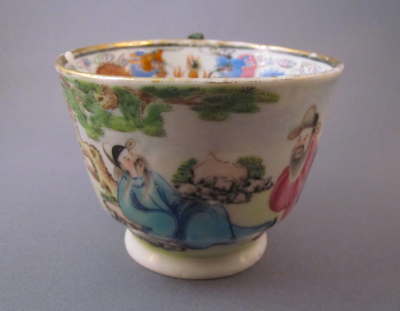 It stabilizes a long vertical crack running the entire length and most likely masks chips along the rim. 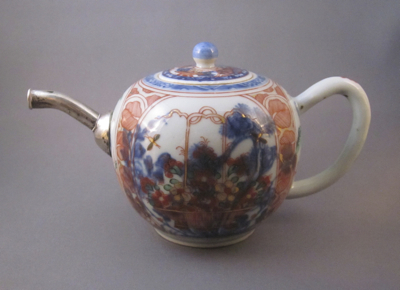 A beautiful solution which further enhances an already lovely piece. 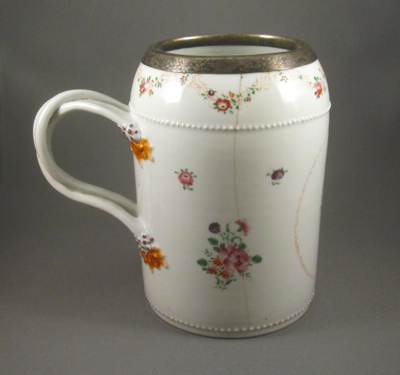 This mug is almost identical in form and decoration but does not have the silver rim that mine has. 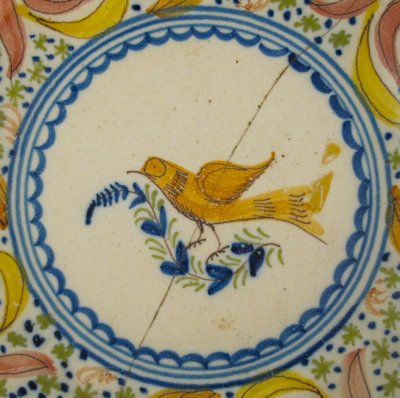 My friend Marianne gave us this lovely Spanish pottery plate, along with two other similar ones, as a wedding gift when we visited her in Brussels last spring. 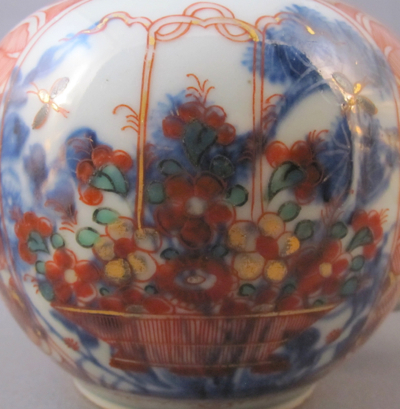 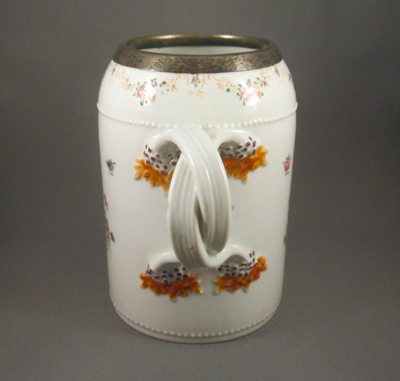 It is tin glazed with a polychrome design of a bird at center and a wide stylized floral border. 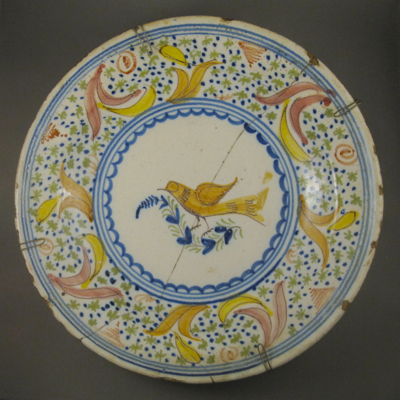 The deep plate measures just over 14″ in diameter and was made in Spain at the turn of the 18th century. 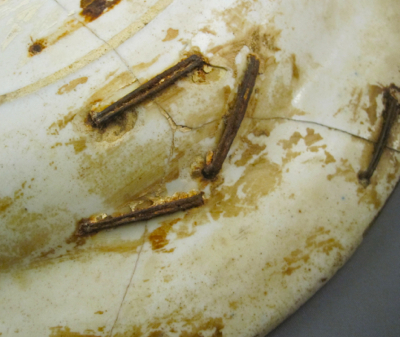 The enormous iron staples measure a whopping 1-1/4″ long and hold together the three broken pieces. 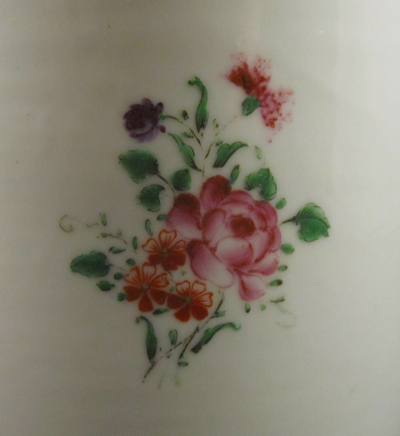 Some of the staples have fallen out since they were first attached to the plate by an itinerant china mender over 150 years ago. 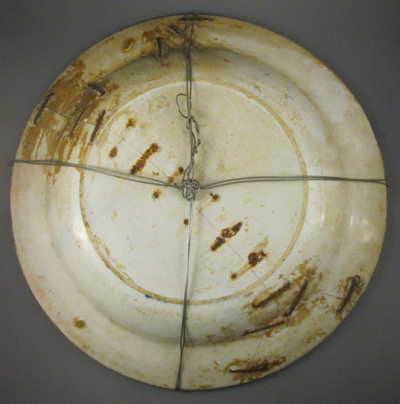 At a much later date, metal wire was wrapped and clipped to the back of the plate to form a crude but effective hanging device. 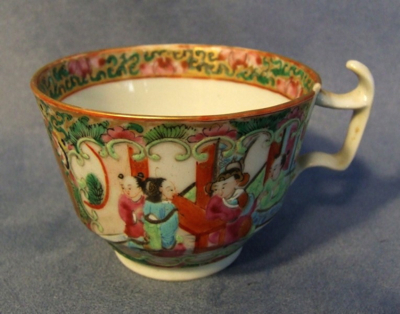 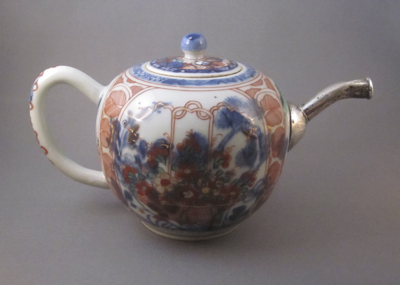 This colorful Chinese porcelain London shape tea cup dates from 1820-1850 and is decorated in the Canton rose palette. 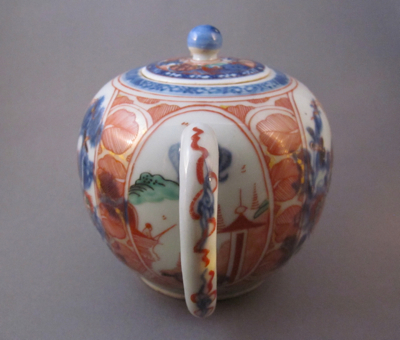 It measures 2-1/2″ high and has an opening diameter of 3-1/4″ . 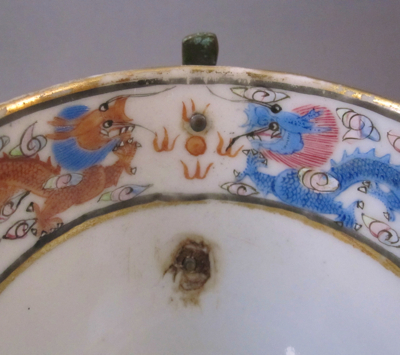 The outer polychrome enamel Mandarin decoration depicts a scene of scholars in a garden, and the inside of the rim has a deep painted border of dragons with small stylized clouds. 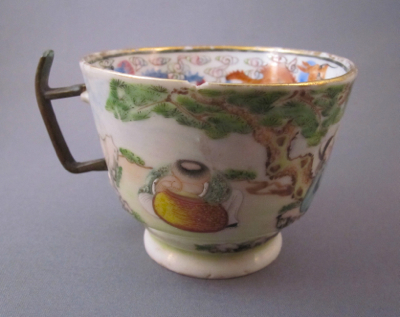 This cup was originally a part of a large dinner service, custom ordered by most likely a wealthy English family. 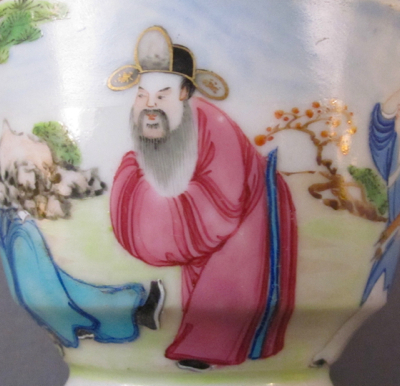 At some point in the early life of the cup, the original porcelain handle snapped off. 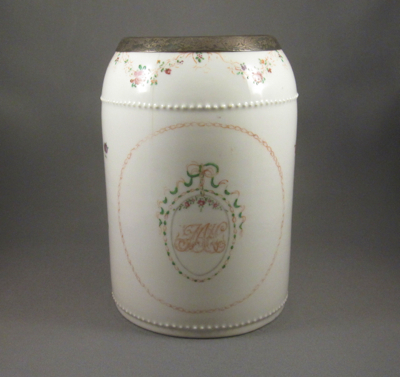 But rather than simply toss out the damaged goods as we would today, it was brought to a metalsmith, who fashioned a bronze replacement handle in the same form as the original. 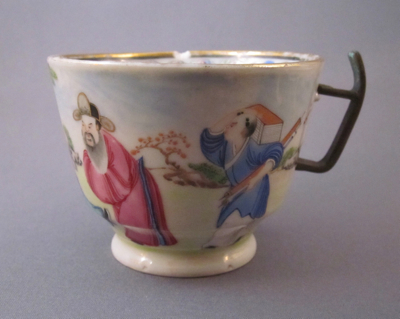 To me, the dark color and sculptural quality of the replacement handle makes this embellished cup much more interesting than its “perfect” counterpart. 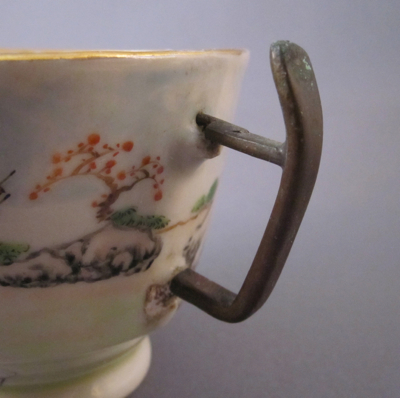 This tea cup still has its original handle intact.